Our PSAN nitrogen plant is the most advanced air separation plants through years of research, tests and perfection in China. Taking solid technology advantages of our company, the plant adopts the latest process and technology in the world and is developed on basis of successful experiences of many suppliers both inside and outside China. It has the characteristics of less investment, simple operation, high automation level, reliable operation, long maintenance and overhaul cycle and low operation cost, low unit power consumption and long service life etc. Aiming on different application field, we can provide different purity index in series. The feed air, after being compressed by the compressor, will enter into the buffer tank to reduce the stream fluctuation, then passes through the filter to remove the moisture and oil mist. The dry and clean compressed air goes into the adsorber, oxygen, moisture and carbon dioxide and other hydrocarbons in the air will be adsorbed, nitrogen is obtained at the same time. The system will change over automatically after the adsorbent is saturated. Then this adsorber will be depressurized to the atmospheric pressure for regeneration. 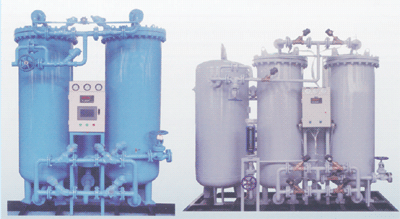 There are two adsorbers working alternatively to obtain product nitrogen continuously. A nitrogen storage tank is provided to stabilize the supply pressure.